A novice will often experience a lot of defeats in his first years as there exists a huge gap between casually playing chess at home and a weekly trained clubplayer. Losses can't be avoided in chess but losing a (long) string of games while everybody is watching you, isn't very enjoyable to say the least. It is no surprise that many already abandon chess after less than 1 year playing in a club. Most clubs acknowledge the problem but I see very few initiatives to support new players. Contrary as I still remember well how my first step in a club (de Torrewachters) happened. As introduction I was proposed to play a casual game against the clubchampion. Well I only learned afterwards that he was the clubchampion when everybody was in disbelief about how I achieved a comfortable draw. I am definitely not a natural. Thanks to playing hundreds, maybe thousands of games (rapid) at home against a chess-computer of the first generation (see chesscompositions) I succeeded to built up sufficient skills to lower the bar. On the other hand as mentioned in my article gambits, this training-method also damaged a lot my further developments. Engines play a completely different sort of chess to what we encounter on the board in a club. Just look at a game I played in 1997. The engine extracts an edge out of the opening but has no clue how to follow up. Nobody, some exceptions apart (see sitzfleisch) will play that passively with the white pieces. Tactically we are of course inferior. In the next game I get an advantage out of the opening but get beaten up after having missed a tactical trick. Also in those early years I analyzed my games. I used (abused) in my advantage the lack of variation in the play of those first generation engines. So I often shamelessly just improved upon an earlier mutually played game. Clubplayers not only variate more frequently but will rarely play the same long wrong lines. My article the list of strength demonstrates this clearly. In short when my son Hugo till a few months ago regularly played chess against engines, I was having mixed feelings. 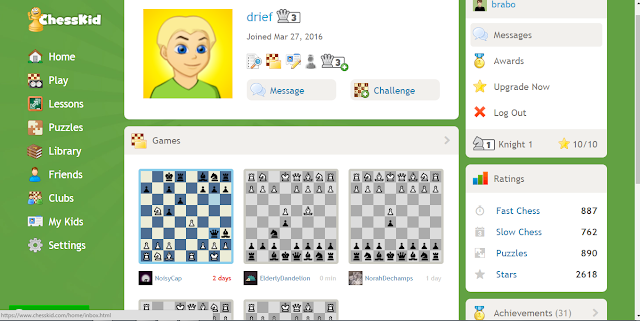 lichess and last but not least Fide Online Arena (that last one was the cause of not having access anymore to our own fide-ratinghistory if we are not wishing to become a member). I just want to add that a new site chessrating is offering partly a solution for this problem. It is something for testaankoop to explain the pros and cons of the different sites and make a final ranking. Readers having a strong view based on experience about this topic are welcome to write something here on this blog. I guess many players are interested in getting some feedback about the different sites. Even harder is to find the right site for the specific needs of beginners. The majority of the games played on the earlier mentioned sites are blitz and bullet as I love to play myself (see the (non-)sense of blitz). This is obviously way too fast for players still struggling to see basic combinations. Besides it is also difficult to find the right challenge as most members are just too strong. At the Flemish chesscriteritum of Blankenberge I got a great tip from Marc Dechamps (1 of the driving forces of the youth-chess at the chessclub of Kortrijk): ChessKid. This site is specially developed for children with games lasting 15 minutes with a few seconds increment which I think is a good tempo. You can do daily puzzles and follow courses. Except ratings there are also stars, medals and rankings to earn. As many beginners are joining the site, you always have a good chance to win some games. My son Hugo started 27th of March, one day after the youthtournament of Blankenberge to play on the site. We chose for the free package as we weren't convinced about the added value of the rest. The site is only supporting English and my son only can understand Dutch. Anyway he quickly got hooked up as I noticed by the records that he was playing even when I wasn't home. I didn't track everything but he probably played 200 games in 1 month. This combined with a quick feedback of papa about recurring elementary mistakes, created an explosive cocktail to improve very quickly. His rating at chesskids increased by 150 points in only 1 month and a first confirmation happened at the Flemish youth chess criterium of Aalter with a score of 9/9. After 3 years of the stepsmethod with very moderate progress, chesskids became a revelation to us. I don't want to tell you that chesskids has no defects. I already mentioned that only English is supported which is for many children not having English as native language surely at least annoying. You can also find some bullies between the members. Just check the very weird records of minicarlsen. As I am very often supervising as parent, my son suffers little or nothing by those flaws. If I tell him that his opponent is very likely not a child then he also realizes that he shouldn't be angry losing the game. If he wants to follow some courses then I enjoy doing the translations. In the end chesskids is only an intermediary point in somebodies development. When and how my son can start to play standard chess is for the moment still an open question. I guess Chess Wizards (https://www.chesswizards.com) can help you to improve the article. In general, nice info. Thanks.